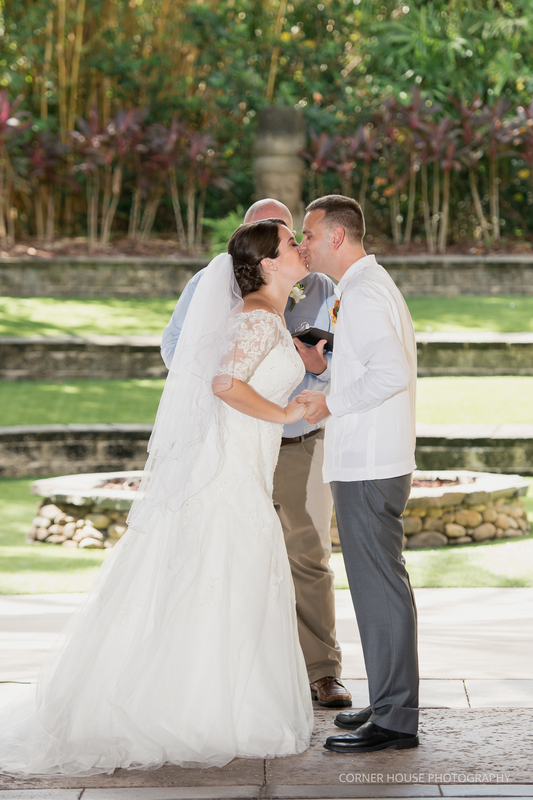 Jessica and Tyler tied the knot during their Loews Royal Pacific wedding. The two envisioned both an outdoor ceremony and reception with a tropical vibe highlighting the beauty of Florida. Their tropical vision stems from an earlier trip the two took this year to Hawaii and included the island state throughout their décor from their save the dates to table signs. It is crazy to think back that just five years ago the two met at Ball State University while both in graduate school. As luck may have it, they both had a class together and upon partnering up on different projects realized how much they had in common. The two had ties to Wisconsin, both were Green Bay Packers fans, and loved running marathons. Their mutual interests was the perfect opening for Tyler to ask Jessica on a date and before they knew it, they became an item! Seriously, you could not smile more than when in the company of Jessica and Tyler. The two have vivacious personalities, are always down to try new things, and love having fun. Their friends were exactly the same and their wedding day was filled with laughter and love. This same silliness and fun that both Tyler and Jessica display is exactly the same characteristic that they love most about one another. Fast forward to the start of their wedding day, we met up with our bride Jessica first who was having her hair and makeup finished up. Grabbing a few fun shots of details and makeup, we headed off to Tyler while Jessica wrapped things up, before heading back for her getting ready in her dress. Tyler’s best man and brother, along with his dad, helped him button up his shirt and took a few shots together. I must say I could tell Tyler was both a little nervous and very excited to see Jessica for their first look. Heading down stairs with our groom after grabbing the rest of Jessica’s bridal portraits, we positioned Tyler in the beautiful outdoor garden located inside the venue. Walking down the long aisle of tropical greenery in the indoor atrium, Jessica was just the most stunning off the shoulder dress and smile. Giving Tyler the biggest hug, he turned around and had just as big of smile on his face to see Jessica. Following their first look, we headed downstairs and outside for family and wedding party portraits. Dappled yellow light shined through massive bamboos, which was the perfect backdrop for the tropical vibe of their wedding day. Storms the prior day moved our ceremony underneath the tropical pavilion where our sweethearts reception took place. It was perfect still as the beauty of the lush greenery was behind them. Balancing our outdoor and indoor light, we were able to bring the outside greenery in verses being blown out by the brightness of day. Sharing their vows and a first kiss, the two took a moment together before heading back in for their first dance. I must say that Tyler completely surprised me with the song choice for his mother son dance. A big fan of Cher, I was quietly dancing on the side capturing the two dance to the lyrics. My first wedding with a Cher song played, it was very exciting haha. More dancing soon ensued along with toasts and an amazing lunch catered by the hotel. Our day ended with sweet goodbyes as the couple hugged everyone as they left. Wishing my darlings an amazing life together, filled with as much joy as they shared on their special day! DJ: Our DJ Rocks – Gaby – love this girl!